The original residence was renovated for a more up-to-date look. 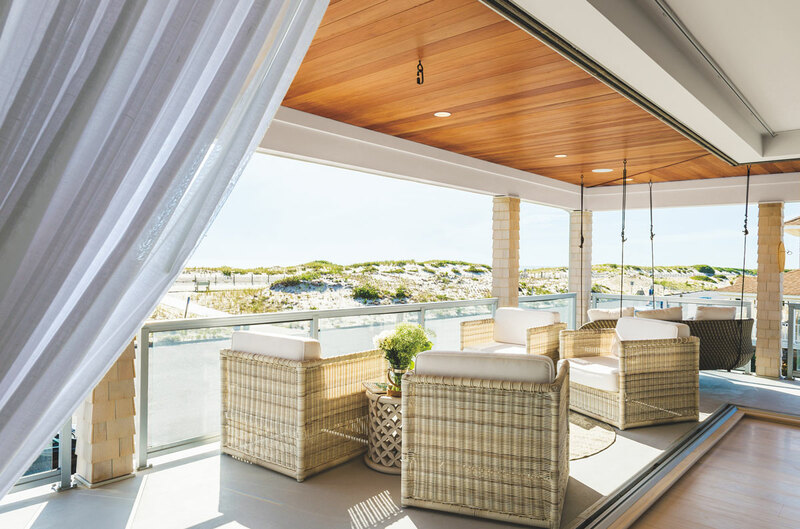 INDOOR/OUTDOOR SPACE | A vanishing wall of windows (see folded windows at the wall next to the drapery), which can be closed during inclement weather, allows for indoor/outdoor living between the family room and the deck. FAMILY ROOM | The traditional fireplace and cabinetry in the pre-renovation family room was replaced with streamlined contemporary features befitting the home’s exterior. CEILING | Wood planks on the ceiling and on the far wall add warmth to the space. OPENING UP | The family room and deck were previously separated by a solid wall (albeit one with lots of large windows). New NanaWalls allow for a complete open-air environment indoors. A spiral staircase connects the main living areas with the pool deck. The backyard features an assortment of amenities, including a swimming pool, hot tub, fire pit and dining space. 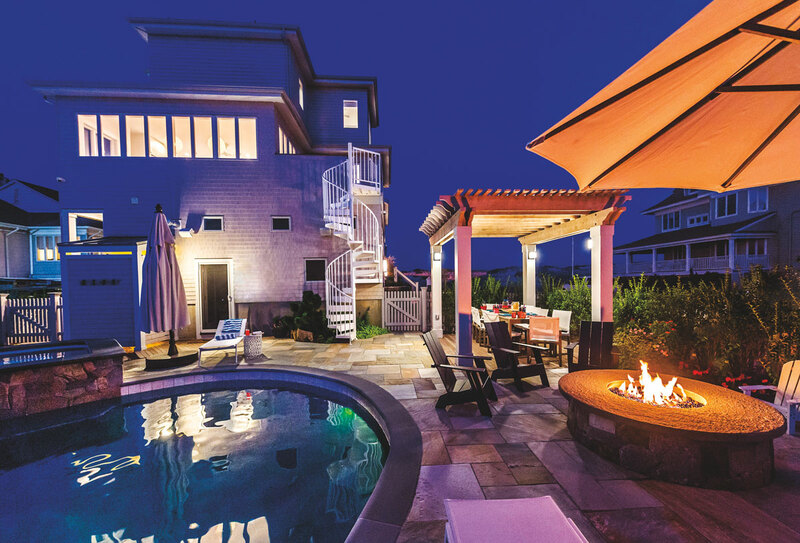 A Seaside Park, NJ home, just steps from the ocean, requires reinforcements. The appeal of a beach house is, of course, proximity. 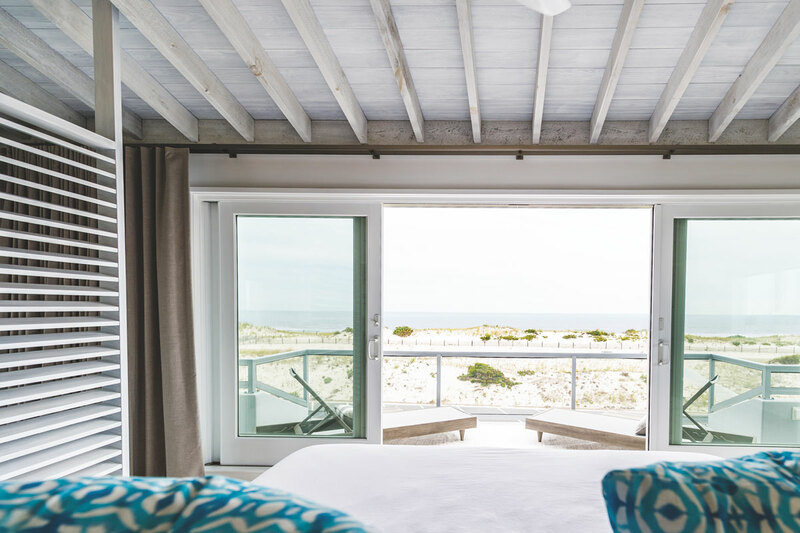 Warm sand, cool water, ocean breezes, endless views—all right outside the door. Still, New Jerseyans know all too well that those coveted coastal comforts can be tricky. The weather at the shore can be fickle, turning from sunny to stormy in a moment. 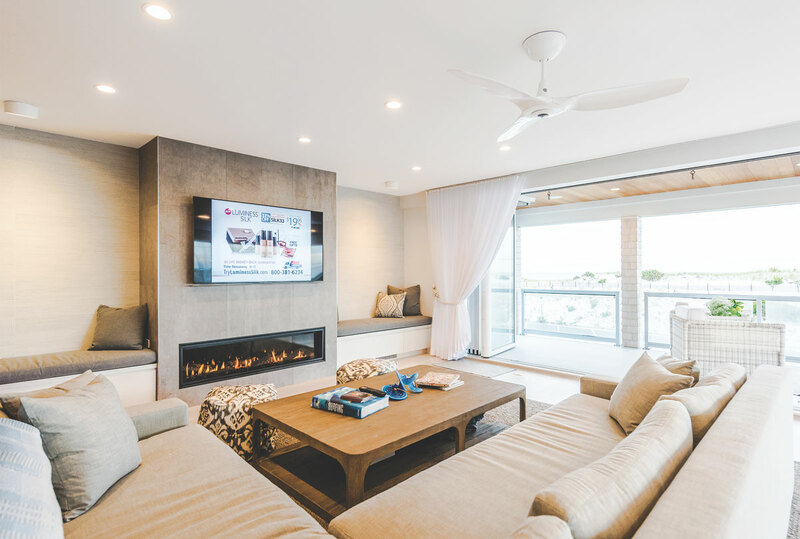 So when a young couple purchased this home, they had two goals in mind: the first was to take full advantage of the location by creating a casual, family-friendly environment conducive to indoor/outdoor living; the second was to ensure that their dream house could stand strong against inclement weather. The homeowners called on Robert Monetti of Monetti Custom Homes in Brielle, New Jersey, to renovate the residence, maximizing both style and strength. Design NJ: Tell us about the style of this home. When was it built? Robert Monetti: The home was built in the early 2000s and had very little original architectural continuity. There were contradicting themes, styles and techniques in the original architectural design. The elements clashed: boxy square rooflines and Renaissance windows were coupled with stained colonial trim and provincial cabinetry. 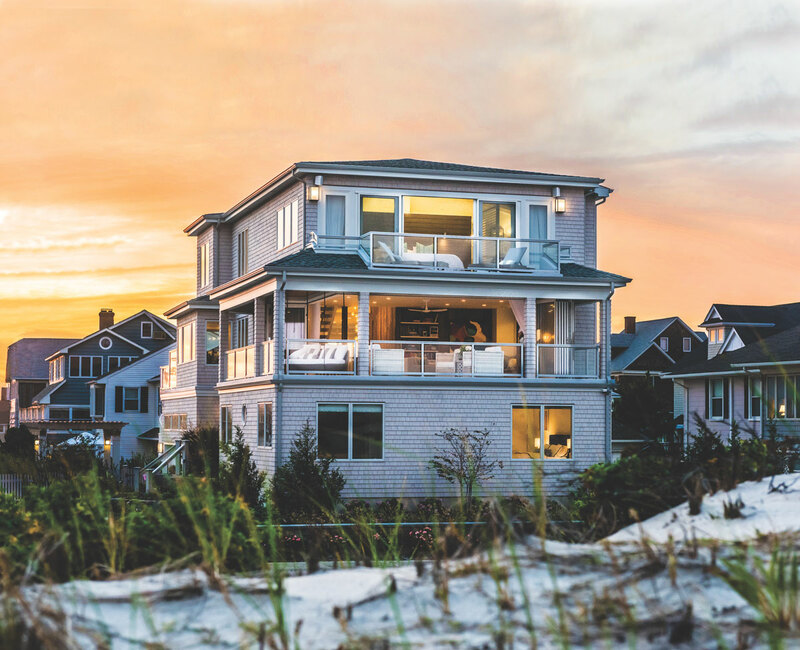 The trend in homebuilding along the barrier island at the time was transitioning away from vertical-sided, trapezoidal windows and vinyl siding. The style was shifting slightly to more traditional homes. This particular home was caught in the middle, and its dark-stained oak interior clearly conflicted with the modern/contemporary exterior. The design aesthetic was a mess. DNJ: What were the owners looking for in this renovation? Monetti: The architectural firm designing the renovation, Manhattan-based Tirmizi Campbell, was challenged with the owners’ desire to completely open up the east main living level through its southeast corner while at the same time supporting the master suite above. The architects used a folding NanaWall door system to achieve this inside/ outside area. 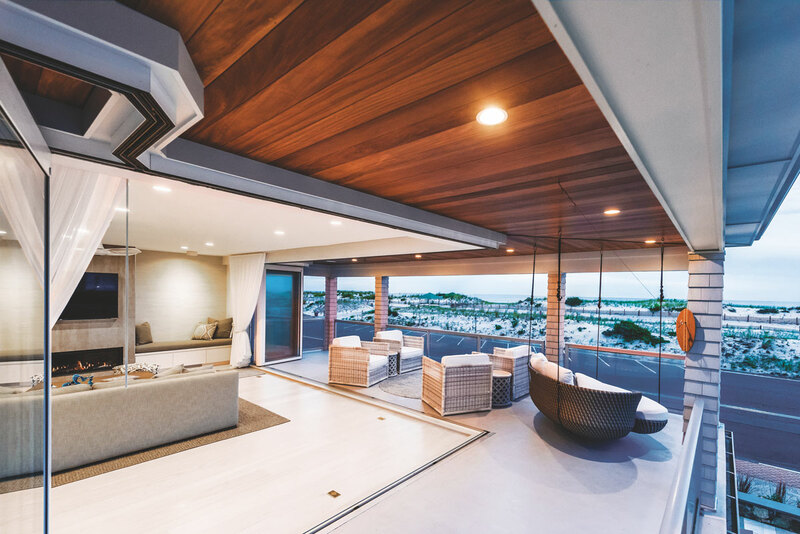 Furthermore, the owners had a clear vision of minimalist, simple and modern interior finishes lending themselves to entertainment and family events. Monetti: The renovation was challenging due to the inferior framing found upon opening the walls. The NanaWall has an “open” corner (near the swing in the interior living room photo), which creates the illusion of the master bedroom level (the floor above the family room floor) being hung in midair in that corner. We were compelled to reframe the existing structure, which we originally presumed had been done properly due to its relatively young age. We had to jack up sections of the existing structure, plane and maneuver existing joists, and install lots of serious structural hardware. Large steel I-beams and cross members were required to transfer loads out onto the deck posts, creating the illusion there is no support. Monetti: The home is separated from the ocean by only a road, so it is subject to all the weather and tide issues the great Atlantic can bring. All windows were designed with impact glazing and superior flashing details in copper. Corrosion-resistant hardware was used on all the windows, a waterproof underlay was used to form a substrate for the new roof and the cedar that was installed on the exterior sidewalls was treated with bleaching oil to protect it and to blend with the adjacent homes over time. DNJ: What do the owners like best about the renovated residence? 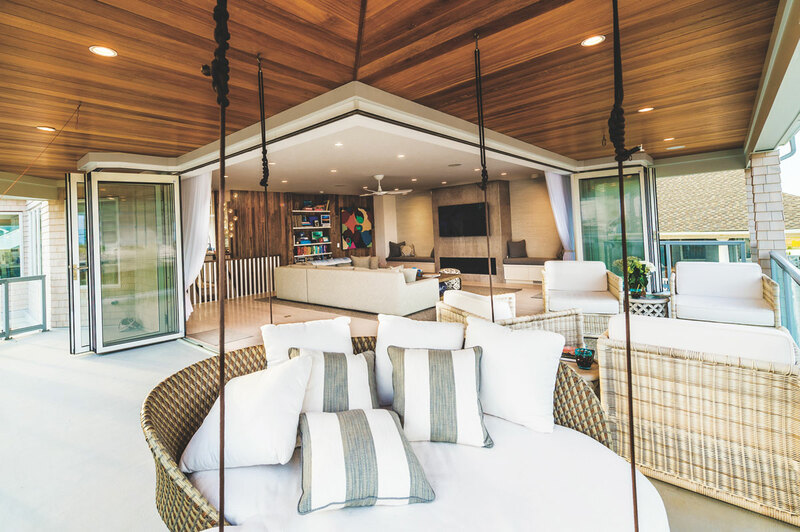 Monetti: They are thoroughly enjoying their “new” home, which works extremely well for massive entertainment in both the interior living spaces and the exterior spa-like yard, complete with hot tub, pool, ipe decking and arched red cedar pergola. 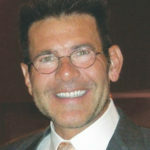 Overall: builder, Monetti Custom Homes in Brielle; architect, Tirmizi Campbell in New York City. Exterior: landscaping and fire pit, Cording Landscape Design in Towaco; pergola, Monetti Custom Homes; table and chairs beneath pergola and sconces on house, Restoration Hardware; pergola sconces, Bega-USA in Carpinteria, California; Timberline shingles, GAF Materials Corp. in Parsippany; roofing, Maibec Inc. in Quebec, Canada; windows, Andersen Corp.; umbrella next to pool, Pottery Barn; umbrella next to fire pit, Frontgate; lattice table next to chaise, Crate & Barrel; Adirondack chairs, Design Within Reach; pool and pool tile, Aqualand Pools & Spas in Manasquan. Living Room: “swing” chair, Frontgate; sofa, throw pillows and throw pillow covers on seats next to sofa, pillows on swing chair and carpet, Restoration Hardware; window walls (open in living room photos), NanaWall in Corte Madera, California; armchairs and tables between armchairs, Serena & Lily in Summit; flooring, Carlisle Wide Plank Floors in New York City; drapery, The Shade Store in Port Chester, New York; custom cushions on seats next to television, Custom Craft Upholsterers Inc. in Los Angeles; wall and ceiling panels, Monetti Custom Homes; shelving, Odhner and Odhner Fine Woodworking Inc. in Easton, Pennsylvania; artwork, Joanne Artman Gallery in New York City; light in stairwell (behind railing), Bocci in Vancouver, British Columbia. Master Bedroom: bedding, Sferra Linens in Edison through Bloomingdale’s in Short Hills; pillows, Bunglo Shay Spaniola in Austin; ceiling planks, Monetti Custom Homes; window treatments, The Shade Store.